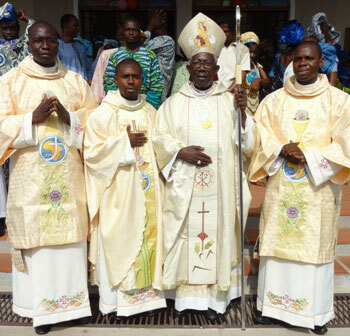 The newly-ordained are pictured with the Most Rev Felix Alaba Adeosin Job, after their Ordination at the SMA House of Studies, Ibadan, Nigeria. The two Deacons will be ordained to the priesthood in 2012 D.V. The family of Fr Ugwu come from Enugu in the east of Nigeria. He had his primary and secondary education in Ibadan. The seed of his desire to be an SMA priest was very much influenced by Fr Damian Bresnahan who was his parish priest at St Andrew’s, Oke Bola, Ibadan in the early 1990’s. He entered the SMA Preparatory Programme, in Kagoro, Kaduna State, in 2001. In 2002 he began his Philosophy studies at the Saints Peter and Paul Seminary, Ibadan. After a pastoral year (Stage) he was sent to study Theology in the Ivory Coast. 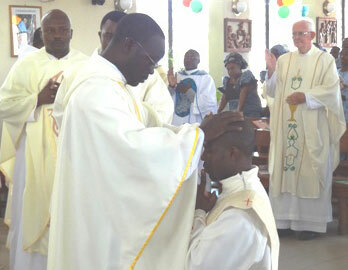 The second deacon ordained was Emile Biaou from the Republic of Benin. Our picture shows Fr Bernard Asuka SMA (from Kenya and working in St Joseph’s Parish, Gowon Estate, Lagos) laying hands on the head of Fr Johnson during the Ordination ceremony. On the right is Fr Tim Cullinane SMA (Brosna, Co Kerry) who is the Spiritual Director in the SMA House of Studies. In his homily during the Mass, Archbishop Job reminisced about the early missionaries and his own early days as a priest and the sacrifices they made, often traveling long journeys by bicycle to say Mass and celebrate the sacraments. Ther Archbishop encouraged the newly-ordained to have the same generosity and self sacrifice. He also used the occasion to highlight some of the recent changes in the Mass. The international face of the Society of African Missions was clearly seen during the Ordination ceremony with SMA priests from several African countries and further afield participating. Assisting the Archbishop during the ceremony were Fr Basil Soyoye (from Nigeria), outgoing Superior of the Bight of Benin, Fr Narcisse Seka Ogou (from Ivory Coast), Vice Superior Regional Superior for Nigeria and Fr Edward Muge (Nigeria), Superior of SMA Formation House, Ibadan. We wish Fr Johnson and Deacons Jonathan and Emile every blessing in their future lives as missionary priests. May they serve the Lord in everything they say and do.